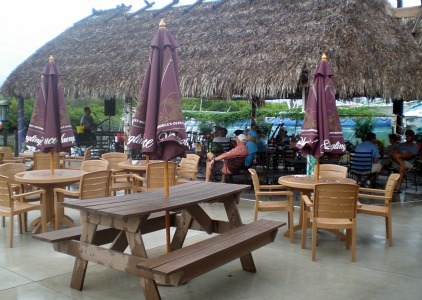 Micelis Restaurant has great waterfront dining, daily specials, and delicious seafood. They are located just before you go over the bridge into Matlacha, right on Pine Island Road. When we drive by at night, the parking lot of this popular restaurant is always packed! I think I know why ..... at Micelis, you can enjoy prime rib, seafood, ribs, and more in a tropical outdoor setting on a canal .......... or inside with scenes of Italy painted on the walls. There's seating under the tiki hut and also picnic tables out in the sunshine. When you sit outside, you'll be able to enjoy live music, which plays most nights. You may also be able to see manatees or dolphins! 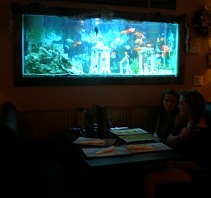 The inside of the restaurant features comfortable booths and tables, murals of scenes in Italy, and a large aquarium with colorful fish. Micelis was voted as having the best happy hour out of all the Matlacha restaurants. It lasts from 11AM-7PM, with a power hour from 4-5PM, Monday-Friday, with extra specials like 25 cent chicken wings, 50 cent shrimp or clams, $5 pitchers of beer, and lots more. There is a good selection of lunch specials for under $10. Choose from tasty salads, pasta, sandwiches, or seafood. 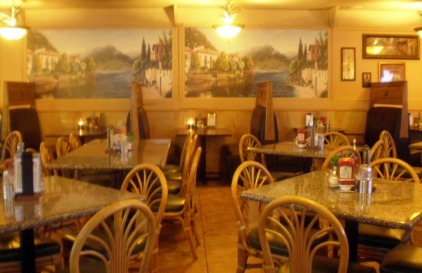 On the dinner menu you will see appetizers, soups, salads, sandwiches, burgers, pasta dishes, pizza, and seafood. Thursday nights are pretty special, you can get 2 Prime Rib Dinners for $20 starting at 3PM. 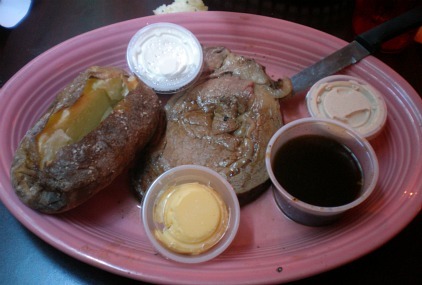 The dinners come with soup or salad and garlic bread and the prime rib was absolutely delicious. Try their 6-pound Burger Challenge, Baby-back ribs on Wednesdays, and Sunday Brunch. Service is attentive and friendly. 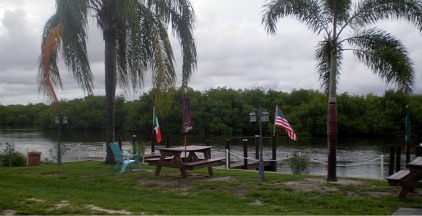 So, if you are looking for Cape Coral seafood restaurants on the water, try Micelis Restaurant.